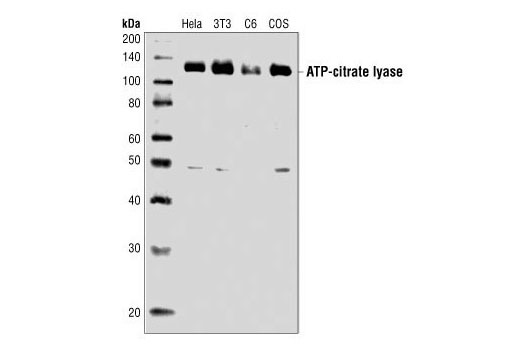 Western blot analysis of extracts from HeLa, NIH/3T3, C6 and COS cells, using ATP-Citrate Lyase Antibody. ATP-Citrate Lyase Antibody detects endogenous levels of total ATP-citrate lyase. ATP-citrate lyase (ACL) is a homotetramer that catalyzes the formation of acetyl-CoA and oxaloacetate (OAA) in the cytosol, which is the key step for the biosynthesis of fatty acids, cholesterol and acetylcholine, as well as for glucogenesis (1). Nutrients and hormones regulate the expression level and phosphorylation of ATP-citrate lyase (1,2). It is phosphorylated by GSK-3 on Thr446 and Ser450 (3). Ser455 of ATP-citrate lyase has been reported to be phosphorylated by PKA and Akt (4,5). Phosphorylation on Ser455 abolishes the homotropic allosteric regulation by citrate and enhances the catalytic activity of the enzyme (2). Towle, H.C. et al. (1997) Annu Rev Nutr 17, 405-33. Potapova, I.A. et al. (2000) Biochemistry 39, 1169-79. Hughes, K. et al. (1992) Biochem J 288 ( Pt 1), 309-14. Pierce, M.W. et al. (1982) J Biol Chem 257, 10681-6. Berwick, D.C. et al. (2002) J Biol Chem 277, 33895-900.